It is the law of nature. 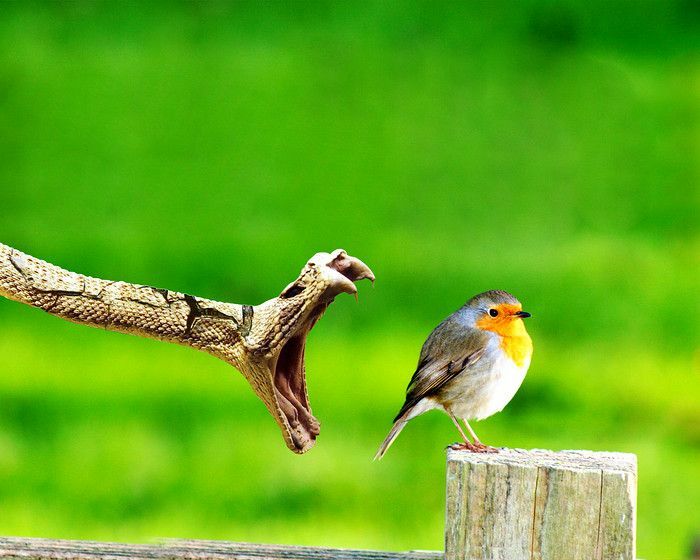 Bird is so innocent, it doesn’t know what will happen after a few seconds… The photographer taked this photo in last second. Thankfully, for the lovely robin, i think this photograph is a fake. Please forgive me if wrong but the horizontal fence post looks like it has been joined together. the photographer ‘took’ the photo. Sorry, i thought i should correct you before someone else does. This is a fake! Tell what you want. Look at the contures of bird and snake, you will see the shaded pixels that happen when you place a mask into a background. Look at where the light comes from. The bird is lighted from the right, the snake from above. This is photoshop work.